About a third of Nepal’s GDP comes from remittances sent back from overseas. After every earthquake comes the social aftershock. Two years after Nepal’s devastating quake, which killed almost 9,000 people and left tens of thousands injured, deep social and political rifts continue to rock the impacted communities. The ruins of the quake exposed the structural poverty driving an exodus of workers to seek economic opportunity abroad. Nepal’s global migration chain, according to new research, has enchained their home country to a system of perpetual poverty and unstable development. There’s a straightforward solution for resolving Nepal’s economic fissures, however: providing decent work within the country that lifts wages and living conditions for future generations. Yet shifting Nepalese society from a migration-driven labor structure to a community-rooted economy requires a new approach to development that departs from standard development formulas, according to researchers with the think tank Just Jobs Network. Nepal’s current economic structure revolves around funneling young migrants through labor-trafficking networks into poverty-wage contract jobs in richer countries, particularly in the Middle East. These jobs typically involve industries like construction that are rife with unsafe and abusive conditions. The remittance economy is structured so that the price of this risk is outweighed by the wages promised—for a few years, at least. But on a national scale, the most promising segments of the labor force are being wasted because of a lack of opportunities within Nepal to build livelihoods and to serve their communities simultaneously. The quake worsened conditions, but it also presents new opportunities. So Nepal’s story may mirror that of “disaster relief” in many Global South countries. Historically, catastrophic storms and earthquakes in El Salvador and Haiti have led to protracted “recovery” processes that generally involve inadequate long-term investment in sustainable industries. Resources are often poured into an aid-driven economy, prone to mismanagement by both international and domestic agencies. In Nepal today, while the country has struggled to recover from disaster, workers who should have been leading that process were instead toiling in low-wage jobs abroad. Between 2008 and 2015, the number of work permits issued for Nepalese migrants more than doubled from about 220,0000 to nearly 500,000, coinciding with a jump in the portion of the GDP contributed through remittances to about a third, up from 11 percent in 2004. Over-dependence on migration is convenient for the government in some ways. When young people can earn fast cash overseas, no matter how bad the jobs are, the earnings they remit home will provide at least short-term wealth and require little planning or infrastructure investment by government agencies. But the hobbled post-disaster recovery process shows that the years of declining domestic manufacturing, along with a lack of spending on education, workforce development, social-support programs, and decent housing, has inhibited development of locally based industries, and entrenched reliance on foreign income. An infusion in public spending might also prevent poorer countries like Nepal from becoming overdependent on the flip side of a migration-based economy: dependence on foreign investment as a means of domestic development. Though Nepal’s manufacturing sector is still relatively weak, elsewhere in the Global South, multinationals have perpetuated precarious labor sectors, such as the garment industry and other manufacturing chains. Just Jobs Network argues that Nepal’s post-disaster economy necessitates a comprehensive recovery that would create the kind of quality jobs that give young people an incentive to stay. Researchers find that “migrants leaving the country tend to have basic education, but they do not possess the skills required for growing occupations—for instance, factory shop floor technicians or accountants.” If there were programs aimed at training and developing skills in a more targeted way, whether repairing machines, providing community-health services, or, in the wake of the earthquake, managing aid delivery and construction projects—the country would get the a greater share of the benefits. Besides, young workers could make better use of their credentials as skilled tradespeople in their hometowns, and pay more in domestic taxes, than they would say, doing backbreaking manual labor for months at a time on an Abu Dhabi luxury resort. Another concrete argument for keeping young workers at home is potentially saving lives. 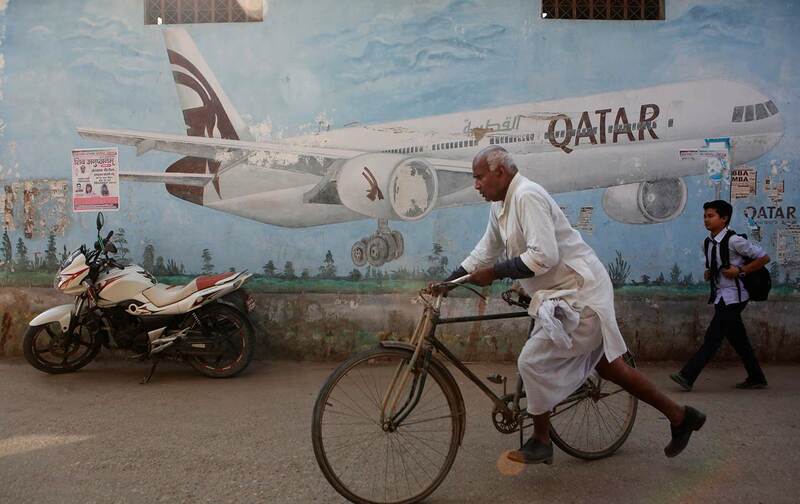 Nepalese workers are physically endangered by indentured contract labor programs in fast-growing economies like Qatar’s. Here, migrants from Asia are hired through labor agencies for manual labor positions, and many suffer injury and death at poorly managed building sites. Researchers anticipate that if basic infrastructure is restored through an equitable development framework, additional stepping stones for social mobility could evolve: According to the report’s author, Gregory Randoph, “the rebuilding of roads in rural earthquake-affected regions can become an opportunity to connect more villages to markets and strengthen local supply chains.” And local enterprises could emerge from the infrastructure laid by recovery projects. But all those possibilities would require stable, democratic political institutions to ensure that growth is even and does not lead to the intense inequality that has accompanied industrialization and trade across Asia’s “middle-income” economies, like India and China. Neoliberal growth must be checked by social protections and organized labor. Nepali migrant workers overwhelmingly work in countries that are starting to curb the number of foreign workers and shift to labor market policies that enhance labor force participation among the native population. In other words, Nepal has grown heavily dependent on income that is not really assured for very much longer. From the earthquake’s ruins, Nepal could grow the resources it needs for its own communities. This time, instead of generating capital in faraway lands, workers could put their country on a genuine road to recovery.